Length: 1 DVD(s) Duration: 1 hour, 40 minutes This self-study package qualifies for 1.5 contact hours. Note: Certificates are be available for $9.99. ABOUT RUSSELL BARKELY, Ph.D. Russell A. Barkley, Ph.D. is a clinical professor of psychiatry at the Medical University of South Carolina and research professor of psychiatry at the State University of New York Upstate Medical University in Syracuse. He is a Diplomate in three specialties: Clinical Psychology (ABPP), Clinical Child and Adolescent Psychology and Clinical Neuropsychology (ABCN, ABPP).Dr. Barkley is a clinical scientist, educator and practitioner who has authored, co-authored or co-edited 15 books and clinical manuals now numbering 24 separate editions. 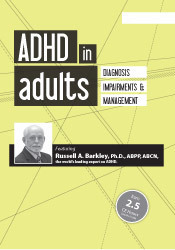 He has published more than 230 scientific articles and book chapters related to the nature, assessment and treatment of ADHD and related disorders. 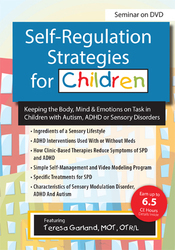 His most recent books include ADHD in Adults: What the Science Says (2008); ADHD in Adults: Diagnosis and Management (2009); Your Defiant Teen (2008); Attention Deficit Hyperactivity Disorder: A Handbook for Diagnosis and Treatment (3rd ed., 2006), Taking Charge of ADHD: The Complete Authoritative Guide for Parents (2005, 3rd ed.) and Assessment of Childhood Disorders (2007). 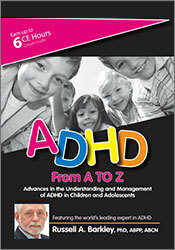 In 1993, he founded a bimonthly newsletter for clinical professionals, The ADHD Report (Guilford).Dr. 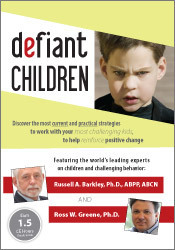 Barkley has presented more than 700 invited workshops, public addresses and scientific presentations internationally and has appeared on the nationally-televised 60 Minutes, the Today show, Good Morning America, CBS Sunday Morning, CNN and many other programs on behalf of those with ADHD. He has received numerous awards from professional associations for his research career in child development and psychopathology and his efforts to disseminate the science of ADHD to both professionals and the general public.